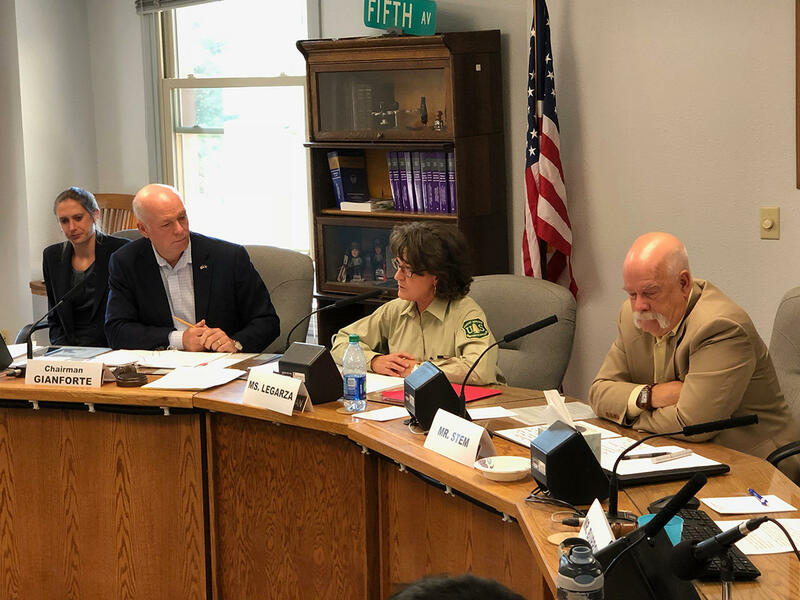 The U.S. Forest Service's National Director of Fire and Aviation Shawna Lagarza and retired USFS employee and Management Consultant Richard Stem at Rep. Gianforte's field hearing on wildfire in Hamilton, MT, August 7, 2018. Congressman Greg Gianforte was in Montana Tuesday talking about wildfire. The Republican was in Hamilton holding a field hearing which started on an unusual note. Rokosch, a former Ravalli County Commissioner, was frustrated that Gianforte’s field hearing, while open to the public, did not feature an opportunity for public comment. The Gianforte camp tells Montana Public Radio that accepting public comment wasn’t necessary since it was a field hearing and no congressional quorum was present. Gianforte told Rokosch he’d be happy to hear from him at a later date. “But today we’re here as an official congressional hearing," Gianforte said. Rokosch interrupted. “So you don’t intend to have a public hearing …"
“So I appreciate you being here and I’d love to meet with you at a later time," Gianforte said. That didn’t seem to satisfy Rokosch. “Oh, well those of us who would have liked to have given you that input today, we’ll contact you and then wait for you to get back to us when we can actually provide you with public input," he said. "Ok. Look forward to that," Gianforte responded. Former Ravalli County Commissioner James Rokosch interrupts Rep. Gianforte's wildfire hearing in Hamilton, MT, August 7, 2018, to ask for inclusion of public comments. With that, Rokosch and about 15 others walked out of the cramped, stuffy Ravalli County commissioners conference room in protest. Gianforte proceeded with the hearing. His scheduled guests included Ravalli County Commissioner Jeff Burrows and Shawna Lagarza, the Forest Service’s national director of Fire and Aviation Management. 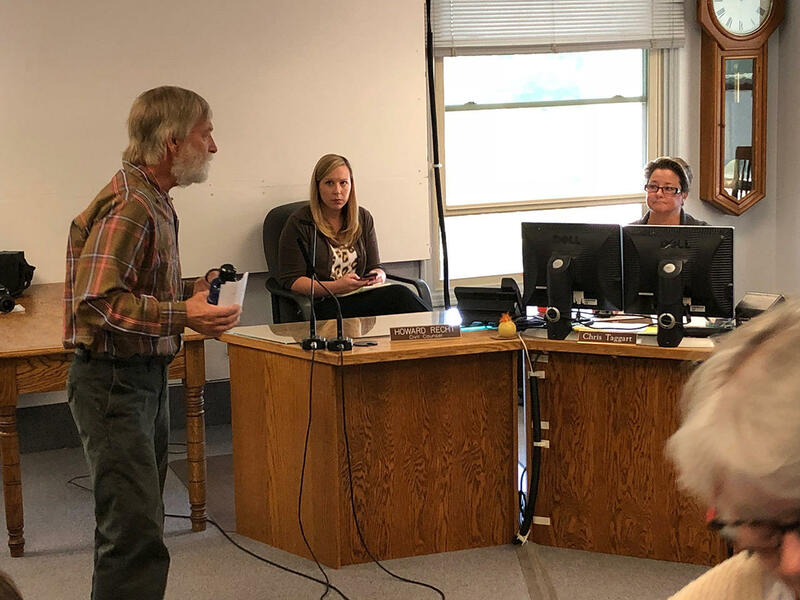 But it was retired Forest Service employee and management consultant Richard Stem who offered some of the most pointed critique of current forest management practices nationwide. Stem, who’s Forest Service career spanned nearly three decades and included various leadership positions, singled out the agency’s Region One – Montana and Northern Idaho – for recently stepping up the scale and pace of forest restoration. “However – I gotta put the ‘however’ in here – overall the agency has some real roadblocks to really stepping up this pace," Stem said. Stem said one of those roadblocks is shrinking staffing levels. 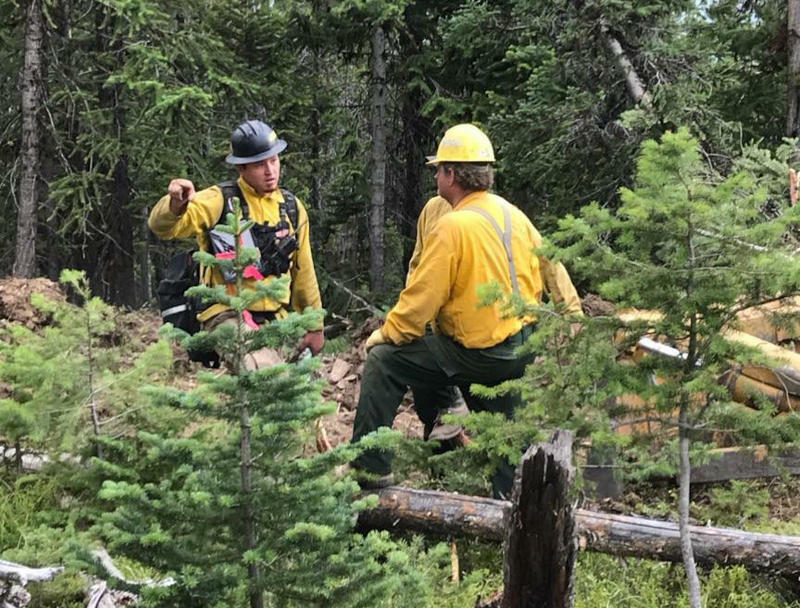 “They have a lack of capacity and personnel and skills because they’ve lost a lot of that capacity over the last 15 years due to firefighting and some budget concerns," he said. Stem said the underlying regulations guiding the National Environmental Policy Act are in desperate need of a tune up. Ravalli County Commissioner Jeff Burrows agrees. Environmental groups point out they haven’t sued to stop a logging project on the Bitterroot National Forest in over a decade. “We need to work more together with our local communities about pre-fire, pre-planning, pre-attack plans, meetings, evacuation routes, who has your bags packed, are you ready to go if a fire comes in there and what kind of management are you going to do on your forests or your lands that are in that area," she said. Outside, after the meeting concluded, Stevensville resident Marilyn Wolff vehemently disagreed with those who advocate for scaling back rules such as NEPA. She also expressed disappointment that public testimony wasn’t accepted. 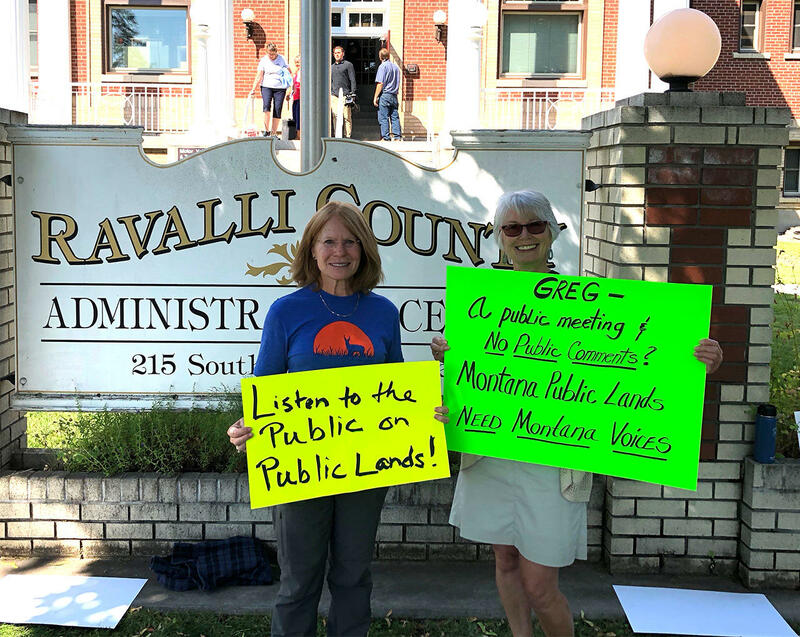 Marilyn Wolff and Micki Long protest outside of a wildfire hearing held by Rep. Greg Gianforte in Hamilton, MT, August 7, 2018. Before he left, I asked Congressman Gianforte, “To those who say, we’re in this situation because the forests have been managed by the federal government, we need to transfer these forests to state control, you would say what?" 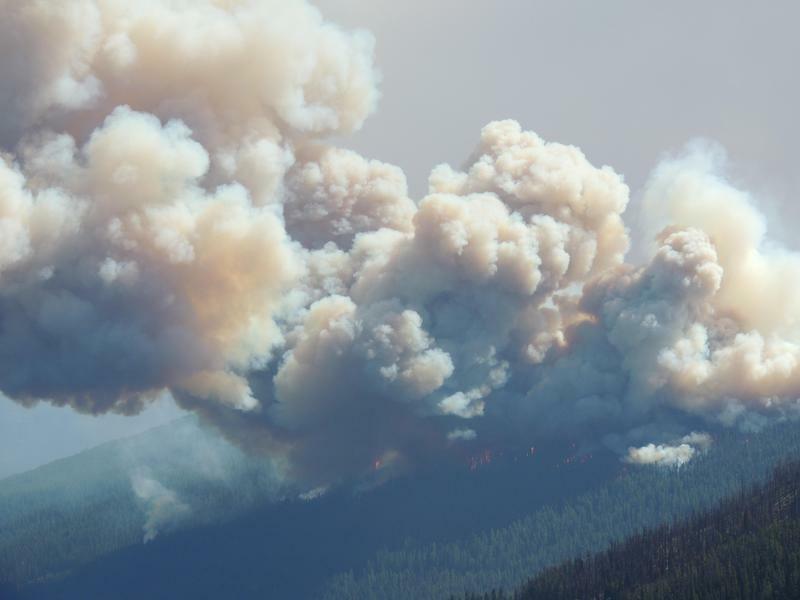 A wildfire burning east of Medicine Lake in the Beaverhead-Deerlodge National Forest was discovered yesterday afternoon around 4 p.m. Forest officials estimate the Medicine Lake 2 Fire, located in the Pintler Ranger District, to be about 45 acres.